1. In a large bowl or zip-loc bag combine vinegar, oregano, and chili powder along with the zucchini, onion, and peppers. Shake or stir it all up. Marinate vegetables in the refrigerator for at least 30 minutes, but not more than 24 hours. I do this the morning I plan to make this recipe. If you forget, it’s no problem, just skip this part and dump it all straight in the skillet. 2. Heat oil in a large skillet over medium-high heat. Saute vegetables with marinade until tender, about 5 minutes. Stir in the corn and beans; increase the heat to high for 5 minutes. 3. 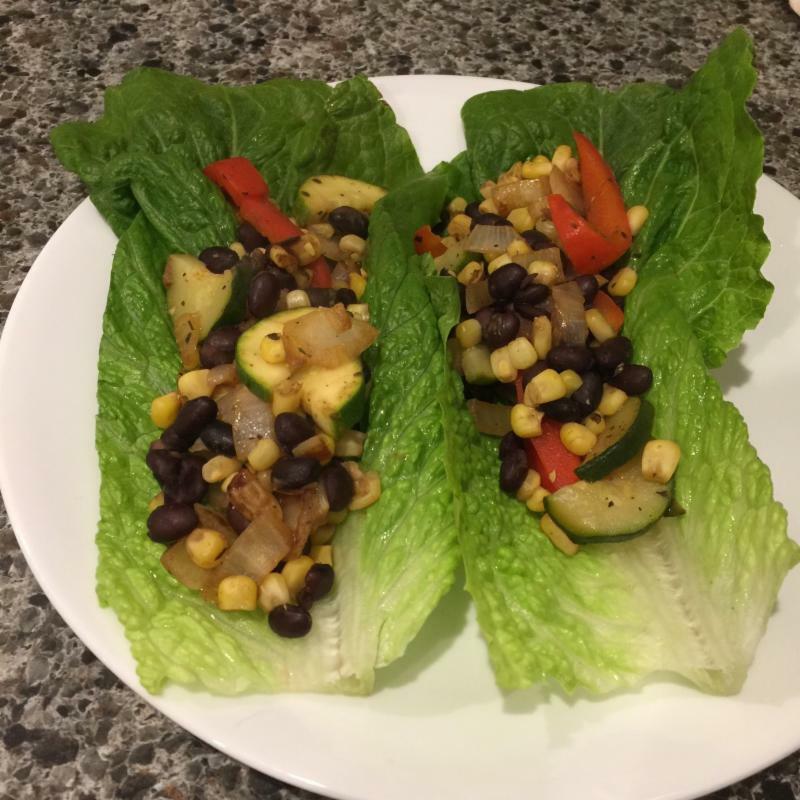 Serve in tortillas or large lettuce leaves fajita style, burrito style, or skip the tortilla and have a bowl of amazing healthy nutritious and delicious veggies! Add guacamole, sour cream (or plain yogurt), shredded cheese, cilantro leaves, squirt of lime juice, etc as you desire. Just consider the calorie count on those first 3 if that’s something that you’re watching. If you’re the only person eating, you’ll definitely have leftovers. If it’s for 2, there will also likely be enough for at least 1 more meal. Feeding 3-4? Just be sure to also have a salad or side and you can probably make it stretch. Especially when breaking up the prep in the morning, and the cooking in the evening, it makes it feel even faster. I can get home from my last class and have dinner on the table in about 10 minutes! P.S. If you’re interested in my Customized Meal Plans, here’s some info. You get 1 week-long meal plan that you follow for all 4 weeks, every day you get 6 meals. We meet for about 10 minutes near the end of every week (in person is best but via phone or text is possible too), 4 times total, so I can guide and counsel you through the process. All that for $75. Grab me before or after class or reply to this email if you have any questions at all. One of the best things about this plan is that if you didn’t like anything you saw, you swap it out for something else. Don’t care for tilapia? You’d click on it and it would give you an extensive drop down list of other items to pick from instead. You review everything at the beginning, making any changes you want, then it calculates and gives you a shopping list so you get exactly what you need for all 7 days!